At Winalot, since 1927 we've been passionate about making hearty recipes with succulent meaty chunks and quality ingredients. It contains all the essential vitamins and minerals your dog needs to ensure every bowl of winalot is 100% complete and balanced. It's the food that generations of dogs have grown up on, because day after day, it never fails to hit the spot. After all, its a dogs life. Composition: Chicken variety: Meat and animal derivatives (of which chicken 4%), vegetables (carrots 4% from dehydrated carrots), cereals, minerals, various sugars.Beef variety: Meat and animal derivatives (of which beef 4%), vegetables (potatoes 4% from dehydrated potatoes), cereals, minerals, various sugars.. Technological Additives: ; Sensory Additives: ; Nutritional Additives: Nutritional Additives: IU/kg: Vit. A: 1500;Vit. D3: 141;Vit. E : 21;mg/kg: Ferrous sulphate monohydrate: 30; Calcium iodate anhydrous: 0.57; Cupric sulphate pentahydrate: 4.5; Manganous sulphate monohydrate: 3.8; Zinc sulphate monohydrate: 52; Sodium selenite: 0.03..
Analytical Constituents: Protein 6.5%, Crude Fibres 0.2%, Crude Oils and Fats 3%, Crude Ash 1.8%, Moisture 82.5%. Feeding Guide: Healthy adult dogs should be fed the following amounts daily. Wet pouches only: 5kg - 6, 10kg - 9, 25kg - 17 Wet Pouches + Winalot Dry Food*: 5kg - 2 pouches + 80g of dry, 10kg - 4 pouches + 115g of dry, 25kg - 7 pouches + 220g of dry.These amounts are averages based on moderately active adult dogs at normal environmental temperatures. Individual needs vary and feeding should be adjusted accordingly. 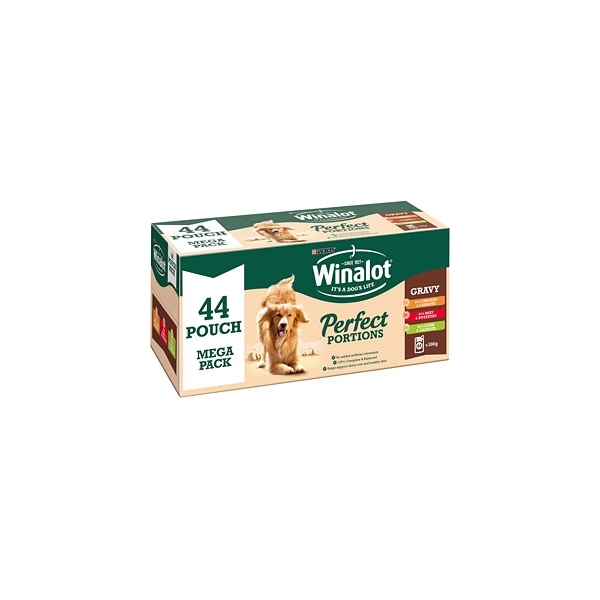 * The mixed feeding guideline table has been calculated using the PURINA WINALOT with beef dry product. Standard delivery (3-5 working days) Northern Ireland & UK: Products under <2kg: £2.95 All other orders: £4.95 or Free over £50.00! Republic of Ireland: £7.95. Our Returns policy complies with the sale of goods act..